Phoenix is the anchor of the Phoenix metropolitan area, also known as the Valley of the Sun, which in turn is a part of the Salt River Valley. The metropolitan area is the 12th largest by population in the United States, with approximately 4.73 million people as of 2017. 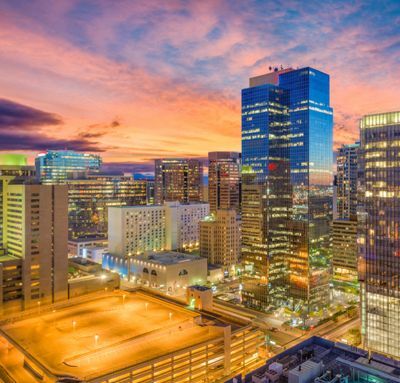 In addition, Phoenix is the seat of Maricopa County, and at 517.9 square miles (1,341 km2), it is the largest city in the state, more than twice the size of Tucson and one of the largest cities in the United States. Settled in 1867 as an agricultural community near the confluence of the Salt and Gila Rivers, Phoenix incorporated as a city in 1881. It became the capital of Arizona Territory in 1889. Located in the northeastern reaches of the Sonoran Desert, Phoenix has a hot desert climate. Despite this, its canal system led to a thriving farming community with many of the original crops, such as alfalfa, cotton, citrus, and hay, remaining important parts of the Phoenix economy for decades. Cotton, cattle, citrus, climate, and copper were known locally as the "Five C's" of Phoenix's economy. These industries remained the driving forces of the city until after World War II, when high-tech companies began to move into the valley and air conditioning made Phoenix's hot summers more bearable.